..:: Sat 10th April 2010 & Sun 11th April 2010 Workshops ::.. In today's world, the focus is often on things we don't have or can't do. Since none of us has or can do everything, this can lead to a feelings of loss, lack of something or inadequacy, all of which can have a profound effect on the way that we relate to ourselves and the world around us. Using the 99 names (attributes) of God the workshop will look at the relationship between these attributes, their purpose in relation to us and the role they can play in fulfilling our potential. This workshop is fully accessible and has been arranged for the disabled, deaf and visually impaired. (Although all are welcome to attend - places are limited please book in advance). 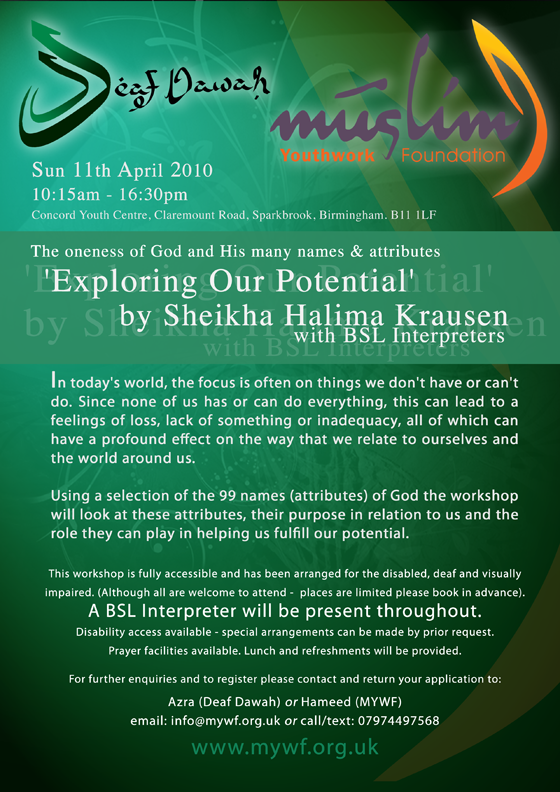 A BSL Interpreter will be present throughout. Disability access available - special arrangements can be made by prior request. Prayer facilities available. Lunch and refreshments will be provided. Cost of each workshop will be £15.00.